I always shoot for authenticity when it comes to costumes, it is the small details that make the difference. So the overalls, boots, and red under armor (to cover up a store bought “muscle shirt”) were the easy parts. I shaved my head, so the Mohawk was attached with double face tape, and the makeup was blended to look natural. The beard and mustache were bought separately so I had flexibility when talking or eating. The hair over the ears was made from fake Elvis sideburns, that were cut and glued on. 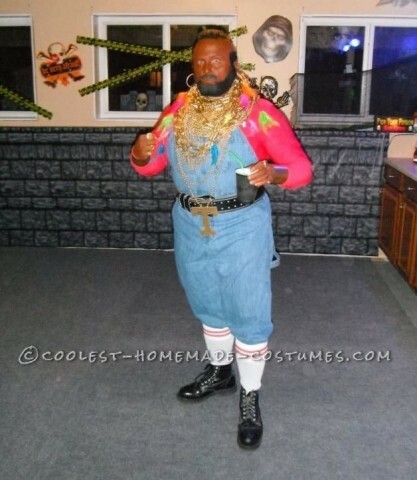 The best part of the costume was Mr. T’s trademark gold! The rings were costume jewelry spray painted with metallic gold paint. The wristbands were pieces of leather with a Velcro fastener that I made, and again spray painted. And of course the chains! I knew I needed a lot of chains, so I mixed it up with different types so it would look like layers (just like Mr. T!). My first thought was to buy drapery cords that were gold, but this proved hard to find and they were not the right color, they looked yellow. So I bought some Mardi Gras beads, (no, I didn’t have to flash anyone) but they are small and looked flimsy. I thought about it, since I am spray painting everything metallic gold anyway, I could use any material I want. Then it hit me, “rope chains”…how about actual Rope! That provided me with the base layer of chains and really created a full look. I literally bought 25ft of rope along with plastic chain links, and spray painted all of it. I wore the beads on top of that, along with a wooden letter “T” that I got from a hobby store. The costume was a lot of fun to wear, and I really played up the character…I pity the Fool! It took some time, but fairly inexpensive (under $100 for everything) and the result was great! Happy Halloween…Fools!